8 Player Party Game Madness! 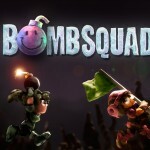 Introducing BombSquad, an explosive arcade-style party game best enjoyed with several friends and a large couch. Jump, punch, throw, and bomb your way to victory as you compete in a plethora of mini-games including Capture-the-Flag, King-of-the-Hill, Bomber-Hockey, and of course Epic-Slow-Motion-Elimination. Up to 8 local players can get in on the action through BombSquad’s support of keyboards, PC gamepads, Wiimotes, PS3 controllers, and XBox 360 controllers. You can even use iOS and Android devices as wireless gamepads via BombSquad Remote, available for free on the iOS App Store, Google Play, and the Amazon Appstore. 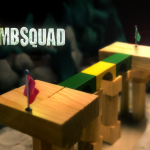 Harness your mastery of physics to barrage your opponents from afar with precision-thrown bombs, or simply charge in and toss your enemies off the nearest cliff; all’s fair in love and BombSquad. Great game! Just wanted to say that you should keep it up! Epic Slow is crazy hahah! No you can actually play with friends offline by asking your friends to connect to your wifi or hotspot (even though you don’t have Internet) and ask them to connect with you in game in gather->local…. Is there a way to do it!!? If there is..than please… Tell. Go to the modding guide episode 2 on this website itself. You just need an another phone or pc and inject simple code. Copy/paste. yep, it is over network! I just wish you could use other macs as controllers too! I “EL – O – VE – E” *LOVE* this game! Thx for the good work. Hey you guys should really make a Facebook page. This game is awesome hope you guys are planning to make updates in the near future! You should make it playable over wiFi. My friend and I downloaded it thinking we could play together. Overall, great game! This is Awesome, best game for mac in a long time, specially for partying with friends. Hove would a team match work if it would be played over the internet? would love to get together with random people to throw some bombs after others. And how about make support to play on more macs in a local game? would love if Each team of 4 could use 1 mac and 3-4 controllers against another team with same set up (WiFi). Love the game, keep it up. IT’S AWESOME!!! I have but one complaint – I haven’t got a mac and can’t find a windows version. Is one possible? Please? you should def add more levels to the practice mode in addition to onslaught. seeing new Bombsquad moves every time I play. I have played so many games on my Playstation 3 and Mac (COD, Battlefield, etc. ), but honestly this game beats them all. It is packed with endless fun that anyone can play. The way it allows iPhones and controllers to join makes it so addictive to play with a group of friends. I play it at school and literally EVERYBODY loves playing it. Eric, from all of us thank-you for making such an awesome/amazing game, and even continuing to update it constantly with more awesome stuff! We love the new TNT boxes and mines!!! If anything, we would love to see a few new characters, as there are so many of us playing and we all have similar characters! (maybe a cool Robot?? Or a Star Wars Stormtrooper? Gorilla? These are all ideas from my friends. Also, a few of my friends just bought the game on our macs, and we would love to see an intergration where we could connect our mac to someone elses as a controller. (maybe on both their screens?) that would be epic. Thanks again from all of us, and lastly, we all <3 the cook! best character by far. Great game, a lot of fun! many nights playing 🙂 I loved it ..
-possibility to create the character. in a unique way. I don’t get it App Store ???why???? one of my best score on last stand.. I really love the game’s physics system, its realistically cartoonish, if that makes any sense. Sorry for taking up more of your time, Eric, but I was scrolling through all of my libraries in Finder, and saw BombSquad’s. I opened it up, and saw the config (which I promptly changed all of my local times and scores to show off to my brother) and also saw a ‘mods’ folder and a ‘replays’ folder. So, two questions: I’m assuming there will be mod support, so how should we go about modding BombSquad? And, When will replay support be added, and what features will be included? Is there some way to make the iOS controls easier to use? In particular I mean running. Am I correct in thinking that the only way to run is to find a space on the phone where there aren’t any buttons and hold there? I bet it would be really easy to run if you set the Volume Down button to run. Great game! Just got the game, absolutely love it, got the latest update (I think it’s 1.2.3) , now it won’t run. I click open and it won’t open. This is an app for my mac. Any help? A small handful of folks seem to be getting a crash with 1.2.3 related to a sound file not loading correctly; I think that might be what you’re seeing. I’ve got it fixed in 1.2.4 which should be released any day now once it gets through review at Apple. If you don’t feel like waiting, feel free to email me at support@froemling.net and I’ll send you a test copy. Sorry bout the bug! Please I want play on my PC. When it will be release for it ? Great Game! Are you already working on a new update? If yes, could you tease something? new characters, stages? Awesome game! One of the best Mac games I’ve seen in a long time. We need a controller for Android badly! this game is AWESOME!!! i play it all the time when i have friends over. please make more characters and an every man for them self mode. you could do stuff like last man standing and whatnot. also good for and uneven number of ppl. great game!!! Has always been crash. Please be improved as soon as possible. There’s currently an issue with Retina macbook pros where the game will crash when you run on the highest res (1920×1200). If you lower your res it should work.. I’m getting a RMBP shortly and will get a fix out as soon as I can track down the problem..
Or would be even cooler if you ported this game to android so u can play it on your phone. that would be cool. I’m having trouble running this game on my macbook pro with retina display. I keep getting the error: “BombSquad quit unexpectedly”. Any fixes? There’s currently an issue with Retina macbook pros where the game will crash if you launch it while at the highest resolution setting (1920×1200). If you lower your res in display preferenes it should work.. I’m getting a RMBP shortly and will get a fix out as soon as I can track down the problem..
May I ask what game engine you used? The ragdoll physics effects are so cool.. I really think you should make your engine publicly available, because it looks gorgeous. You could earn extra money that way. Please consider it, because it’s a great piece of work. This game is the best 5 dollars i have ever spent on any app period, I hope there is another update! Please bring something big!! Enjoyed this game on my friend’s Mac! This game is so funny that we played it for 5 hours! Also want to ask if there would be a Windows or Linux version of this game? I would like to buy one. Yes, please allow this to be played on Windows. I’d love to play it on my PC. It seems fun and I’d love to try it. Thanks! Please make more levels/characters/game styles. Can I have version with player limits removed? I wanted to play with friends, but one of us had to sit back and watch other 4 playing ;( There was no other way we could play together but fighting against each other which we didn’t want to. It should just say ‘None’ if you typed everything correctly. that is awesome, should go somewhere on wiki 🙂 thanks! Yeah I should put together a wiki site for the game one of these days, especially since I’ll be opening it up to more customization and stuff soon..
Is there any way to get newest update on older os/x? I replaced older bombsquad version i bought with newer version from friend’s comp, but it would require newer OS/X version upon launching. I opened up Info.plist and changed version, but i still get force close before app even starts working. I have Snow Leopard, 10.6.
email me at support@froemling.net and I’ll hook ya up..
Is Steam store in your plans? I’d greenlight it in a heartbeat and so would other players too. Yeah my hope is to try and go through steam for a mac/windows/linux version after the iOS version comes out..
That’s excellent to hear! Especially since the steam controller and steam machines will be coming out this November. 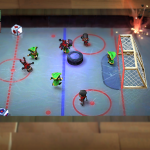 I’ve bought Bombsquad on both the Ouya and Android platforms, and will happily buy it again on Steam! This is absolutely the BEST game on Mac App Store! Please release a PS3 version so that I can play it with my families! And please add Internet multiplayer version! Does bomb squad connect to controllers through Bluetooth? It should work on any controller that supports Macs, whether bluetooth or not. PS3 controllers both use bluetooth and they work with it. Let me know if you come across something that doesn’t work. Also please add it to PS3! Does bomb squad use Bluetooth to connect to controllers? Also please add it to PS3! Hey, looks great. We’re about to dl the game, but we just have two macs… Is there a release (even beta) that we could play locally over network? Thanks! Hey I am having trouble with the game. It used to work perfectly on my macbook pro but now when I open it it quits unexpectedly. I could send you the report if that helps. Yeah could you send me the crash report? Did this just start happening on 1.3.4? Email me at support@froemling.net with that and any other info that might be helpful. I’ll try to get to the bottom of it asap. Hi, congratulations for this fabulous game. I Contact you to ask for information on use Wiimotes. The game has recognized the controller but it only work with buttons 1 and 2. The nunchuck don’ t work. How do I use the other 2 buttons? Or the nunchuck’s buttons? The newer Wiimotes (the ones that say ‘Wii motion plus INSIDE’ on the bottom) don’t work with accessories like nunchucks but all the buttons should work. If you take the battery cover off, there should be a sticker with the model number on it… it should be something like ‘RVL-003’ or ‘RVL-036’.. can you let me know what yours says there? That might help figure out what the problem could be. The buttons 1, 2 work, the buttons A, B don’t work and nunchuk don’t work. You are great! We are going to start playing in 8 Players! PS. This game is awesome! 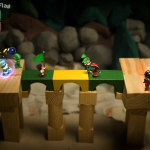 Have you thought about modding/allowing users to create levels? Could generate a fantastic little community! Great, sounds awesome! I can’t wait to be able to contribute content to the game! I saw that the game modes and maps are currently written/supported with little (Python?) scripts and I think that would be a great way to expand the game. I believe you’re currently focussed on networked play at the moment (is there any eta), but was wondering if you’d looked into using another mac as a controller (similar to the mobile apps), or even as a “controller hub”. One problem we experienced yesterday when we tried to play with upwards of 8 people was that quite a few were used to playing with an Xbox controller but we couldn’t host more than 4 controllers on a single mac (or more than two keyboards). It would be great if we could have a second mac to plug controllers/keyboards into that could then connect to the mac running bombsquad as a set of external controllers to make it easier to play with large numbers. The “controller hub” mac, wouldn’t need to display anything on the screen as it could just send the buttons pressed across to the host. Network play is coming along slowly.. it’s a pretty huge overhaul so I still don’t have an ETA for it. That sounds good.. I’d be happy to share source code or protocol info or whatnot for the remotes (it’s pretty simple). Email me at support@froemling.net and I can send stuff your way.. Brilliant game! I was almost about to regret to have bought an Ouya, because so many things don’t work properly. But when i tried your game, everything was fine again! I love it already and i haven’t even tried multiplayer yet! Best 5 euros i’ve invested this year so far, hands down, and i can’t imagine that some game might be able to top that. You, sir, might have created the killer app for the Ouya there. At least i will tell everybody about that game… As a fellow game developer congrats to this great title. fantastic game – and impressive given the solo coding effort! it’s really nice to see more games on OUYA that are fairly polished and not “retro” (there are fun retro games, sure, but we need diversity). i got hooked and bought it the first night, and now i can’t wait to hook up a bunch of devices for party mayhem. crash: keyboard devices. this is probably an OUYA problem, but i had a crash when i plugged in a USB keyboard. the OUYA got wonky shortly after that, so… yeah. 1. throwing distance control: my buddies and i find it tricky to get an intermediate toss with the OUYA controller, especially with a quick shot. adjusting the running delay before full power is reached would work with the current system, but have you tried basing distance on how long the throw button is pressed? the trackpad or right analog would make an interesting control for throw direction and distance – and you could throw in one direction while walking in another. 2. why don’t PCs throw a bomb sometimes? nothing ruins round 5 of Pro Onslaught quite like a bomb going off in your hands – a bomb that you were frantically pressing “throw” for. i may have only seen this with regular bombs, but i’m not entirely sure. only tried on an OUYA controller. 3. stats for my player profile! geeks love stats. multi-kills, sticky headshots, edge throws, flags scored/stopped, times killed by each NPC type (f’ing ninjas), stats stats stats! 4. more player model customization. even just swapping heads, torsos, and legs between the models would be a fun and simple customization. 5. obscured player outlines. i was thinking about a map with columns of different sizes scattered around, so you run around the columns, seek cover, and chuck stuff over the short ones. but it’s kind of annoying when your PC is obscured by a map object – how about some PC (but not NPC) outlines when you’re obscured, a la Left 4 Dead? 6. flag pick-up and drop effects. sometimes it takes me a second to notice that a Conan punched me and made me drop the flag! a uniquely-colored sparkle or sprite pop or something would help notify as well as add some game show-zazz to competitive modes. 7. map editing. sure, sounds like fun. i like your stock maps plenty, tho i would like to build that column map. 274. network play. this just isn’t a priority for me, at all. 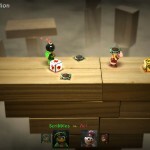 this is a fantastic in-person multiplayer game that seems best enjoyed on a couch with friends. there are aspects of the game that are potentially frustrating (ninjas, running control, impact explosives, baker waves), but they are just challenging, unpredictable, and fun enough to make the game compelling. one thing that makes this frustration manageable is sharing it with friends! last night my buddy and i played Pro Onslaught over and over and over without completing it, but every defeat either left us laughing or steeled with more resolve to conquer it. if we were just sitting in separate houses, communicating via VoIP or text, we probably would have gotten much more frustrated and bailed a lot sooner. plus, network play adds a huge QA load to the game. frankly, i think you should focus on polishing your rad game that people already love so it becomes a first-purchase game on OUYA and other TV devices (Google TV? Steam Big Screen? Xbox?). sure, local tablet Wi-Fi gaming is a lucrative market, but they’ll still be there after the players in the light-gaming TV market have lining up and been recognized as the killer apps. you’re pretty much there, keep that ball rolling! Dude, thanks for the awesome feedback; I’ll definitely be re-scanning over that and adding things to my to-do list. Glad you like the game, and don’t hesitate to holler if you have any other thoughts/ideas. Cheers! I love the fact that you comment back to people! Ouyas only come with 1 controller, and additional are so expensive (half the cost of the whole system?). It’s definitely a felt need. Some kind of haptic feedback enablement option would be nice, because it’s a little hard to know if I’ve pressed the correct button. I’m honestly impressed with how responsive of a controller that my Galaxy Nexus becomes, and that my old DroidX is even viable to let a friend use. Oh! if there’s a way to allow either of the volume buttons to be used like a bumper/run button that could be interesting. so, friends love the game. it takes about 30-60 seconds to build control familiarity for anyone used to a console controller, and soon after the laughter, screams, and cheers begin. 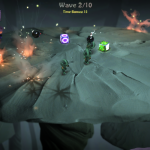 epic mode is particularly pleasing (pro tip: time your bombs, people, or i will just throw them back at you – tsk). i’ve tested the OUYA with Xbox, PS3, and Android controllers; it was freaking out with more than one Xbox controller, but you may have patched that. – grabbing the head of a player that someone was carrying, playing tug of war, then letting go and watching them both fall off the edge – but not before the carried player got caught on the edge and they both hung there for a few thrilling seconds. – smashing multiple frozen players in one punch. take that, cryogenics! – the terror of being surrounded by bombs in epic mode. – throwing anyone over an edge, ever. – co-op player number difficulty scaling is kinda uneven. two-player beginner Football is a walk in the park, four-player is very hard, even once the chaos settles down and people are focused. the barbarians seem to take 2-3 punches to drop the flag, while PCs drop it in one hit. infinite Runaround seems to scale well. we still haven’t finished pro Onslaught with 1-4 players, but we got close once with 4. – more readable text on OUYA. all text is a bit small for TV gaming. an increase of 10-20% across the board would increase readability and open up some of the packed-looking text displays. you would need to enlarge some dialogs and other fixed-text displays correspondingly, but it’s a TV, go for it. also consider another general UI typeface, or another weight of the one you’re using. text displays such as the help screens and dialog contents could switch to a more TV-friendly weight or face, and label text such as buttons and dialog titles could remain the current typeface (Hobo?). – more distinguishing features between PCs and NPCs in co-op. the fog of war is not kind, especially when your dark blue ninja friend is in a scrum of black ninjas. in addition to whatever player customization you may have planned, some player-distinguishing VFX would be excellent. outlines, brighter text labels, enlarged heads, something. another option would be to ensure that no PC color scheme gets close to an NPC’s. Pingback: MySoreThumbs -- Blog » The OUYA Unboxed! This is a class game Eric keep up the good work. So addictive and fun with friends. I have thought up a few things which would help to improve the game. -More characters or even the ability to create a character. -Character bonuses like the ninja could have more speed, muscle guy strength etc. -Ability to play over wifi with other players. Thanks keep up the good work. It is class the way it is so don’t add too many more items and ideas which could ruin the simpleness and amusement of the game. This game may be my favorite multiplayer game since HALO:CE. 8 Player local is so damn epic and fun. Glad you like the game :-). Dude, this game is god-like for party. We need more maps and updates!! After watching the YouTube video for this game, I went out and bought an Ouya that very day. Since then, Bomb Squad is still the only game my friends and I ever really play, and it kinda makes me wish more of my $100 Ouya purchase could have gone directly to you, rather than my $5 game purchase. Bomb Squad is incredible, the Free-For-All modes are good with an odd number of people, but the team games are timeless and will probably never, ever get old. Football, Duel, and Assault are just incredible modes that have had me laughing more than just about any game I have ever played. I know you are probably a little discouraged when the console you released on is the only reason that sales are not higher, but this is without a doubt the BEST game on the Ouya and probably will never be topped. 8 players is a rarity and impossible on any other console, and yet the 6-8 player team games are the game at its best. Please continue to develop this game. Heck I’d gladly pay another $5 for a DLC update, I wouldn’t say that about many games, but you deserve more for what you’ve done and I’d gladly pay if it fuels more content and more drive for you to complete it. 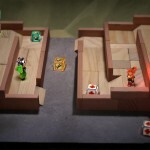 This game looks like a tonne of fun on the Ouya! Unfortunately my country doesn’t have any local retail shops that sell the console and I just sold my Mac PC. Are you planning for an Android/PC/Linux release in the near future as I kinda now regret selling it just to play this game with my friends! Is it possible to release this for normal android, in Play-store or something alternative? I am constantly amazed at the attention to the little details each time I play this game. I am always finding things I didn’t think were possible and it’s hard for me to believe this game was made by one person. As an aspiring game developer for Android, what can you us about how you made this game? What graphics/physics library did you use? Well, I wrote the graphics engine from scratch but I wouldn’t recommend that unless you really like OpenGL coding (I do). If I were starting over today I’d probably at least take a look at Unity. As far as dynamics, I’m using Open Dynamics Engine, but these days Bullet is the way to go for that stuff.. Hope that helps! Hey Eric could i get a Windows version of the game pls? i totally love your game but i cant afford a mac. i play it everyday at work where we have a macbook. Hope you can help us fast. juro que es de los mejores juegos que he tenido la fortuna de conocer lastima que muchos de mis amigos no quieren jugar un juego sin graficos ultra wow! pero es una chulada tu juego una mega felicitacion por hacer uno de los juegos mas divertidos del ouya hasta ahora! y super barato! un saludo desde mexico!!! i really like the game and i wanna say that is… awesome!!!! i like it even more than the tower fall in ouya! its the best game for co op couching game! really!!! thank you!!! it’s super addictive! and super cheap!!! keep going doing more awesome games like this!!! if you could add more modes of play that will be more cool! thx! This Game really need alot more attention than it got so far! Its by far the best coop / party / fun game to play. Everybody can play this game, even if you keep dying it is just hilarious – I love your work, and cant wait for the windwos version ! Are there any news on the windows version? This game looks amazing! will it come out for windows to? Cause that would be awesome!! Hi! Yeah; I’m testing the Windows version currently and plan on releasing it along with the iOS/Android version once I finally get net-play and a few other things finished.. email me at support@froemling.net if you’d like to help beta test.. When is windows coming out? i want it so bad! When this game coming out for windows? As soon as I can get networking and some other stuff added.. email me at support@froemling.net if you’d like to help beta-test early versions..
Once again awesome game! We’ve just had a friend come over with PS4 controllers and we they don’t seem to work with BombSquad when connected over Bluetooth. They work just fine over USB. When connected over bluetooth the game reports “1 controller detected” but there is no response to pressing any button in game. Hmm.. if you go into BombSquad’s Settings/Controllers/ConfigureGamepads UI, are you able to configure the PS4 controller when its in bluetooth mode? It may just be that button mappings need to be set up. I haven’t tried a PS4 controller myself though so I can’t say for sure.. I too have troubles with my 2 PS4 controllers, their in bluetooth connection on my mac but bombsquad does not accept then unless i plug them in via USB then everything works just fine! Therefore button mapping cant be done when in bluetooth mode. Odd.. do the controllers work in other games wirelessly? If you poke the PS button in the middle does it make a difference? Gorgeous and hilarious, probably the most fun game ever! It’s so difficult to find local multiplayer games, let alone games that are actually fun! You did a hell of a good job, keep it up. Any more games in the pipeline? I have admired your game for some time now. It’s my favorite game. The rag doll makes it hilarious! I play it everyday! You inspired me to develop for OUYA. I watched BombSquad on YouTube, and knew it was awesome. I’ve been trying to make a game, but I just can’t get it to work. I tried setting up the UNITY 3D Engine with OUYA, but it wouldn’t work. I’m lost and need help. I’ve seen your interview with OUYAS, and it showed you programming. The code looked to be C++. I’ve looked up how to use C++ with OUYA, but nothin works. Could you please be kind enough to help me? What language did you use? Is it C++? Did you use any frameworks? How did you get that language to work with OUYA? Have any tips you could give me? Please reply. Hi, any idea when an update with networking will be out ? Gongrats for the awesome game ! Hey There. I discovered your blog the usage of msn. to bookmark it and return to read more of your helpful info. doesn’t work with any game in BlueTooth Mode. this Post on a Steam forum explains it pretty well. Hey I got an idea about this game! please add tracking bomb as it touches the ground it will roll over to the enemies. I’ve been thinking about some ideas like that.. could be fun.. I’ll hopefully have some time to experiment with new powerups soon-ish. Thank you for replying me so quickly! And I’ve got another question here, does BombSquad support PS4 controllers? Im about to get a PS4 and if the game supports the PS4 controllers that would be convenient because if not so I have to buy an additional PS3 controllers for the game. Do you have any update on BombSquad for Windows? I don’t have Mac, OUYA or Amazon Fire TV, and I really want this game! Also, do you have any plans on releasing it on the PS3 or PS4? Do you have any update on BombSquad for Windows? I really want this game! Also, do you have any plans on releasing it on the PS3 or PS4? PS. Do you have the Android TV version for this app? I think run Bombsquad directly on big screens is a good idea. Hope I can help you by testing or something else. 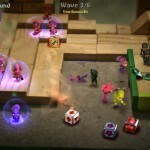 Is BombSquad free 2 play in Ouya? Yeah; it currently has an hour long free period on OUYA. 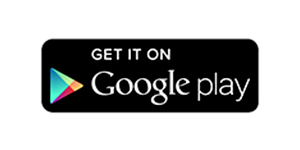 I’ll be switching it soon to match the Google Play version (free indefinitely with upgrades you can get). Yeah I saw your email (sorry I haven’t responded yet).. Things are a bit hectic right now with the Android launch happening, but I’ll see if I can fix that and get XP back up and running when I have a spare moment. (though at some point in the future I may have to start limiting it to Vista/Win7+). Thanks for the heads-up! I truly love this game. Do you have any other upcoming games? I would certainly wait for them. Thanks! I still have lots in store for BombSquad.. I have other ideas that would be fun too, but this will probably keep me busy for at least a while.. I sent You a e-mail message. If you need a tester with Windows 8.1 I can help you. I played your game with my friend’s (on android) and was great! i really like this game! i want to play it on my laptop (windows 8), would you sent me the link for the windows version?? thank you..
Is there any linux build? Or is that built in linux? It’s sooooo fun and I can only play it on Android(I don’t get a Mac)! shoot me an email at support@froemling.net and I can hook you up with a linux test build..
I’ll be switching the existing versions of the game over to free once I get the 1.4 update done for them.. hang tight..
I’m working on several ports, so hopefully there’s somewhere you can play it now/soon. Just launching on Google Play (android) this week..
this game is amazing I hope you make a ps4 version because I would love to play it on ps4.Great work! AWESOME GAME! Just downloaded it to my android phone last night and I was instantly hooked to this game. My friends and I love the multiplayer game as well. I would just like to ask if you have a PC version for this game? Or if you have a beta version I would like to test it as well. Yeah I’m working on a PC version; email me at support@froemling.net if you’d like to help test early versions of it.. Thanks! I just emailed you last Oct 7. I hope you received it. This game reminds me of the fun that, I had as child. Me and my friend brought this game yesterday and begun play it and before we knew the clock was almost 5:00 in the morning and I had to wake up to go to work ad 07:00. The Android version is awesome, 5/5 stars on that! I was wondering, since you said that you were working on the Android/Windows versions at the same time, does that mean that the Windows version will come out soon? I really want to play on my TV, and I think the only way I could is through an HDMI connection from a computer. If you know any way a tablet-to-TV connection could work, please let me know! Again, 5/5 stars, this game will be the first game on my eventual channel. I tried to play the android Version of Bombersquad with a PS4 controller and it kinda works but it’s so delayed that IT is unplayable. Do you try to get them working? PS: Awesome game, really love it playing with friends! Hey Eric, whenever i play a wifi game with my brother on the same network but 2 different devices there is always a lag with the connecting person and not the host. is there a way to fix this ? Sorry about that; the network code is still very new and doesn’t perform great yet.. there’s some tricks that games use to ‘hide’ lag that I haven’t had time to implement yet. I plan to keep working on it until it behaves nicely, even if it takes a few months..
Hi Eric! Are you going to add a system of update ? Could you elaborate on that?.. Why does it say, i can’t connect to another device because their running on another version? Please someone help. Hey Eric, huge fan of the game and my friends and I can’t get enough of it (especially 8 player chaos in multiplayer). Can’t wait to see some extra maps and variants coming out, meteor shower is great, I’d also love to see a boxing ring or sticky arena in the future! One small question, will the people who have already gotten achievements that give tokens before the update be able to receive said tokens after the update? I’m working on some new mini-games now; stay tuned.. I’m also working on making it easier to mod the game so hopefully other people can add their own mini-games. And yeah I just fixed things so that from now on people will get all the tokens from achievements they’ve gotten before the update. Has there been a rollback of the latest update on Ouya consoles? I hit ‘update’ before playing today and lost all of the new features. “LISENCE CHECK FAILED” !!!!!!!!!!!? 1.4.7 Stupid game !!!!! 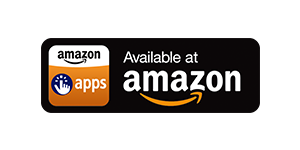 I recommend you to try to install the Amazon AppStore on your device, then try to uninstall BombSquad and reinstall via the Amazon AppStore, then try again to buy the upgrade. hello, did u use a game engine to develop this game? if yes, which one? if no, did u do all these programming by yourself? I love this game. I play it with friends on almost all the platforms. I would love if it was available for Windows and it would open it up to a lot more people. Great job on the game. P.S. If you need a tester for a Windows version. I would love to help. Thanks for enriching our lives with Bombsquad. I play this game on my ipod, on my note 4 and I wish to play it on my windows pc. I have 4 controllers, it would be awesome if I play it with my friends and even with my girlfriend, she loves this game and this is a unique thing. I would be very glad if you let me test the windows version, I will surely help your work. Thanks again for making this funny game. Hi Eric! Is the game available on IPHONE as a standalone game like its on android! Would love to play the game on my Iphone. It’ll be there.. sorry I’m slow. Am helping some friends with their game project at the moment so my BombSquad time is a bit limited, but I should be ramping up again before too long. Hiya Eric.thanks for your hardworking team and your best android multiplayer game ever…we love it. I remember previous updates, there was Santa Claus character, easter Bunny and easter egg mini game…. But now, I just downloaded the latest version from Google Play but I can’t see the Santa or bunny or some more prhps!!! Have you got some plans to port the game to Universal Windows Platform (Windows 10, Windows 10 Mobile, Windows 10 on Xbox and HoloLens)? It may be a while still, but I hope so!.. Does your windows build works with windows xp? I haven’t tested XP lately so I’m not sure, but I’m only officially supporting Windows 7 and newer so I have my doubts. If you look at my archive of old builds though you should be able to find a slightly older one that works with XP. But I have a problem since the last Mac OS X Update. My PS4 controller does not work… actually, it works “two” good. Literally, the game thinks there are TWO controllers. I’m really confused. On every other game, it works fine, as usual. But when I want to play BombSquad its messed up. I click on the “X” and two players join the game. And it says all the time “Player1 has the menu control”. Please help! I’m totally addicted to this game! I just fixed this in version 1.4.105. It should be out on Monday or Tuesday once it get through review at Apple. Sorry ’bout that! Hello! This game is so amazing. But I had some troubles when playing by PS4 controller via bluetooth, since it connected to game, there are two players appears up with single controller, and I can manipulate only one of them. I’m guessing this is the Mac version? If so, then this is a new bug with macOS Sierra and I just fixed it in version 1.4.105. That update is waiting for review by apple and should be out on Monday or Tuesday. When i buy the game from the Oculus store on my PC, is it possible to play it without VR on a regular screen with my friends locally (on one computer on a TV screen) as well? Yeah; you can right-click on it in the Oculus window and launch it in Desktop mode – that’ll bring up the regular version of the game with local multiplayer support and all that jazz. Where can i get this game for PC? cant find it anywhere. Nintendo Switch needs a game like this!!! The game is brilliant!! Having fun all the time! Could to please add more maps and characters?! I like it so much!! Congratulations Eric! This game are the best that i played i n my life. Thanks Eric :)! Awesome! Looking forward to it! How much money can we throw at you Eric so that you’ll port this to Steam or Switch? That is a brilliant idea. However, it’ll take a bit of work before getting onto Switch though. I hope the game reaches that goal! You should add more maps to the game 🙂 this is a great game should have more maps soo… two more? 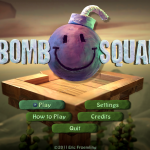 Please Eric, make that BombSquad game for windows phone also. 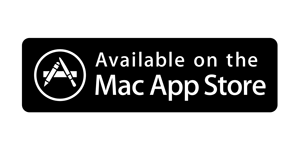 Put it on windows store…Please. That game is just AWESOME!!! When will there be the actual gameplay on iPhone? Please make this for HTC Vive! I played it a couple years ago on cardboard and loved it. I would play a lot on Vive if you can make it happen! I’d love to. (I have a Vive too). Just a matter of finding the time.. I’m currently cleaning up my VR builds (cardboard, GearVR, Rift) so maybe I can sneak that in..
Hmm it shouldn’t need any specific video card. If you are seeing any specific errors can you post them here or send them to support@froemling.net? I m not able to unlink my account…i have linked it since 6months..but when i try to unlink account it said 25days remaning…after some days it get till 9days remaning…..but today now again it is saying that 29days remaning..???????? Did you link another account in the meantime? The counter can reset when you link another account. I’m not super knowledgable on copyright law, but if you’ve made your own assets for a mod-pack you should automatically have the copyright on them I believe. Please don’t take my word for it though; I’m sure there’s good info a Google search away..
Hello, Joyride Modpack creator here. Mods in any games are considered Fair Use based on someone else’s work. If you make a work that uses someone else’s intellectual property then there’s no way that can be copyrighted. If I wanted my modpack to be copyrighted then every single addition to that game needs to be 100% created by me or have required licenses. That would be total utter madness if someone decided to copyright a work that cointains content from other modpacks. Several people steal from me stuff and there’s no real way to defend yourself from it. I’m not a law expert, but the rule of thumb is that mods are in this gray area that are hard to define. It’s on case by case basis. TL;DR Don’t ask someone to copyright your work – you’ll not get it. Das Spiel wäre für ein iPhone auch nicht schlecht ich würde das auch gerne auf mein iPhone spielen unterwe. Es ist schon auf Iphone ich denke. Ich weiß es nicht genau, weil ich kein Iphone habe. Ich spreche kein Deutsch, ich spreche Englisch. Ich habe das von Google Translate bekommen. Hey Eric,I’m unable to play in the tournaments because a message “tournaments unavailable due to rooted device” keeps popping up. please help!and my device has no root at all!! I don’t understand how to put it on my windows PC. I’m only 10 (almost 11)! Please say it in English, easier to understand. It would really help. I have it on 3 devices already but its hard on the Nabi 2 and RCA Galileo Pro. I want it on my PC so me and my almost-6-year-old brother can actually play with no lag and freezing. Thanks! Is there any way to unlock Pro mode in the PC built? Would be great if there is. Rarely play on my phone as the PC controls are much better. Also, how about releasing the game on steam or somewhere with PRO mode features unlocked? I, for one, would definitely buy and recommend it to others. Nope, I turned 11 on June 22nd! How to run commands without mod and hack? Hey Eric! Why don’t you make a port for Nintendo Switch? I’m waiting for your game since the Switch launch, it will be perfect for it! My friends will throw money for it for sure, so you can easily release a bombsquad paid version and no one will complain for that. Hope you will read me and goodbye from Italy! You’ll definitely be able to help as it gets closer; I’ll start releasing some public alphas/betas and testing/feedback will definitely be helpful. There should be some fun new modding possibilities around that time too that you can hopefully take advantage of. Cheers! The biggest problem would be porting Joyride Modpack over. Since a lot of stuff is probably going to be changed, rewriting code would be total torture and waste of time. Is there an easy way to move my stuff over to 2.0 when it releases? Should I be worried about major code changes? I’ve seen it happening during the last updates (from 1.4.36 onwards) and it’s been really messy cleaning all the stuff up for the new version. I am trying to put mod files on bombsquad for OUYA, but I don’t know what file type to use. Do I use .apk files or .py files? Can you add bots for all games? Guys,I got idea:Bombsquad downlodable on ps4,xb1,nintendo switch and steam. And a discord srever! 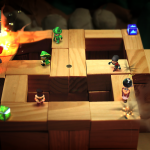 This game is perfect for Apple TV, and if money is the issue – Kickstart it! It was my favorite game on OUYA, and I’d gladly chip in to help fund the development of this version and others. Absolutely loved how a friend could show up, download the controller app, and jump in on the fun! how Can we download this game??? Does that mean you are working on a Nintendo Switch version/port of the game? Hey Eric when i install bomb squad on my pc it says some kind of dll is missing. Now what shall i do to install it on my pc. There should be an installer included for the msvc runtime; did you try that? Can any one help? I have friends visiting and this is our favorite game to play together. It looks like the game’s sound system isn’t able to start up for some reason. Can you make sure you’ve got the latest drivers for your sound card and all that and see if that helps? First I’d like to say that this stunning looking game is giving me and my family a lot of fun moments! But there’s a problem; I downloaded Bombsquad at my Smart TV (Android) and bought the Bombsquad VR on my phone which gave me the Pro version for normal game. But I don’t have the Pro on my Smart TV.. Would be nice to have it on the Smart TV to! Same Google Account. Could you help me? Many thanks. Glad you like the game! You should be able to link the account on your smart tv to point at the account your vr version, and then everything will be shared between them (including pro). Look for account-linking in the account section in the main menu. Hope that helps! I couldn’t get it right linking the Pro version which came along with the VR Bombsquad. So I bought it once again in the normal game and now it works on my Smart TV. Thanks anyway for the help and quick respons and the extra money I spend is well deserved because with you make my 4 kids smile with your game! Any plans on porting it over to the switch? My ouya only gets used for this game lol. I would like to retire it sometime soon.